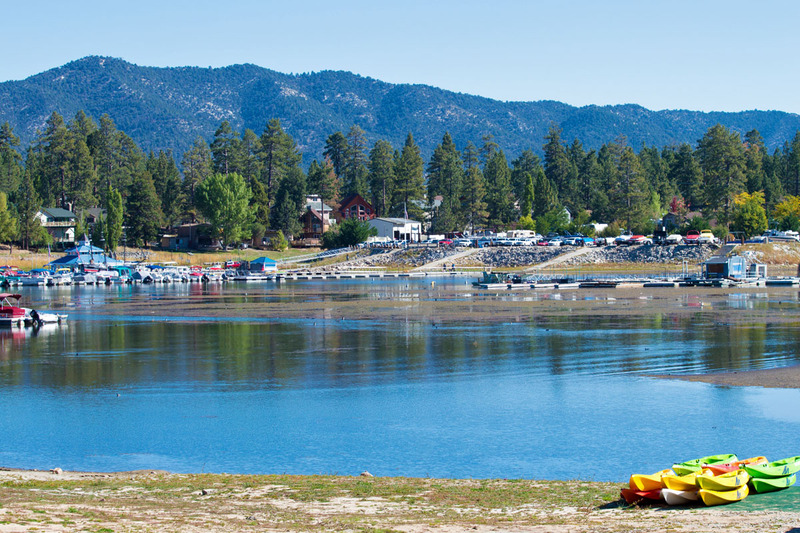 This week we take you far above the palm trees of the pacific coast to Big Bear Lake which is nestled in the San Bernardino National Forrest some 6,750 feet above sea level. Taking the place of the palm trees are the massive and fragrant pines. Instead of a seemingly endless ocean there are mountain ranges as far as you can see, and the smell of the ocean is replaced with crisp fresh alpine air. 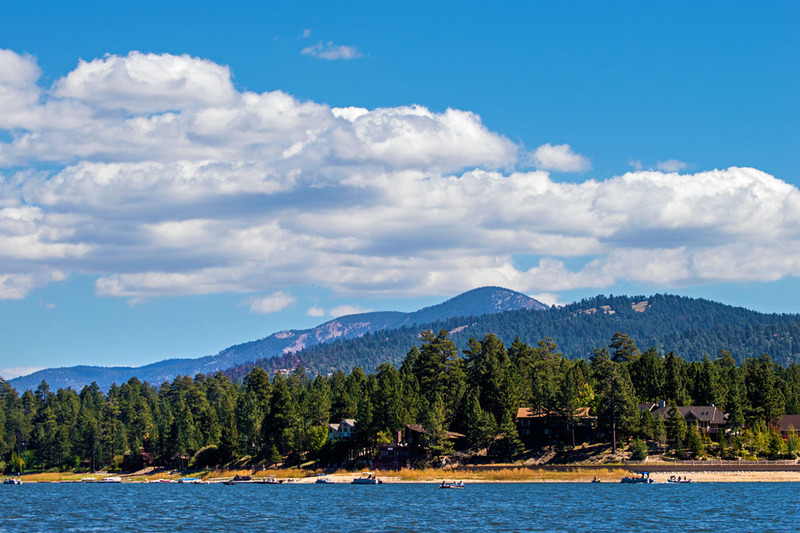 Just about two hours from Los Angeles, Big Bear Lake can be accessed by a few different routes. We took Highway 38 up the mountain which is a little longer but not as mountainous. This highway adds about 20 minutes to the commute but is less windy or crowded. 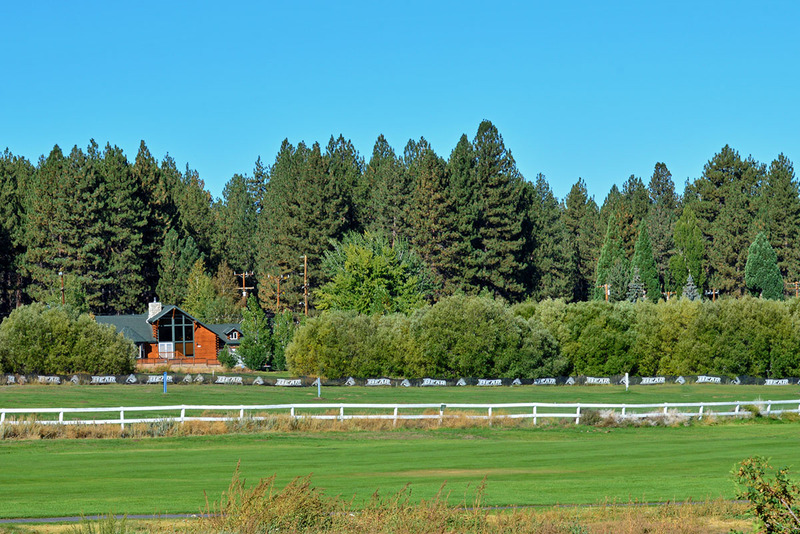 We stayed in a cozy cabin very close to Bear Mountain Golf Course in the Moonridge meadow area. I made a note to come back to play golf as I hear the ball travels farther because of the altitude. Unfortunately, even though my ball may travel farther, I don’t think it will help the rest of my game. Maybe I’ll just rent a kayak instead. 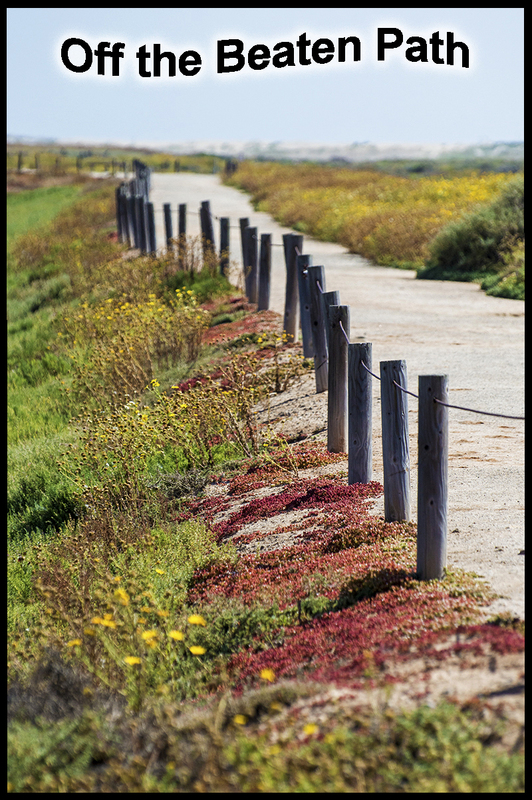 Pleasure Point and a nearby RV park. 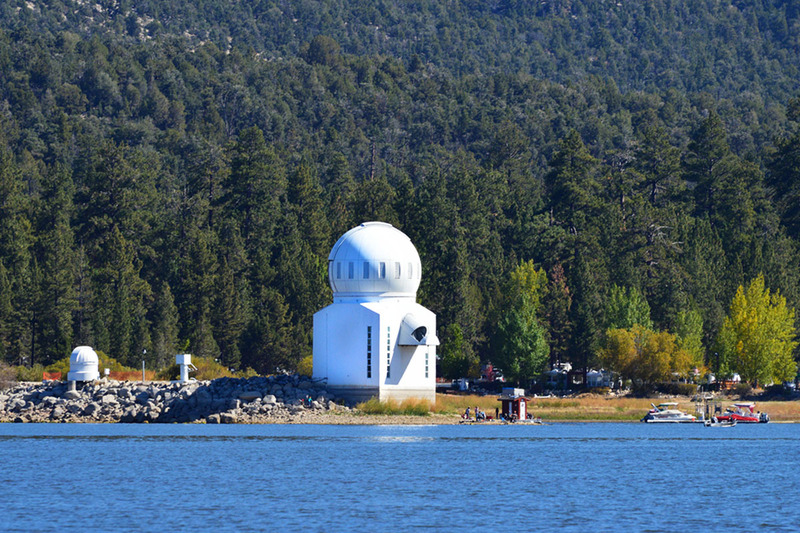 We explored every part of the lake including the Big Bear Solar Observatory, one of six solar observatories in the world. 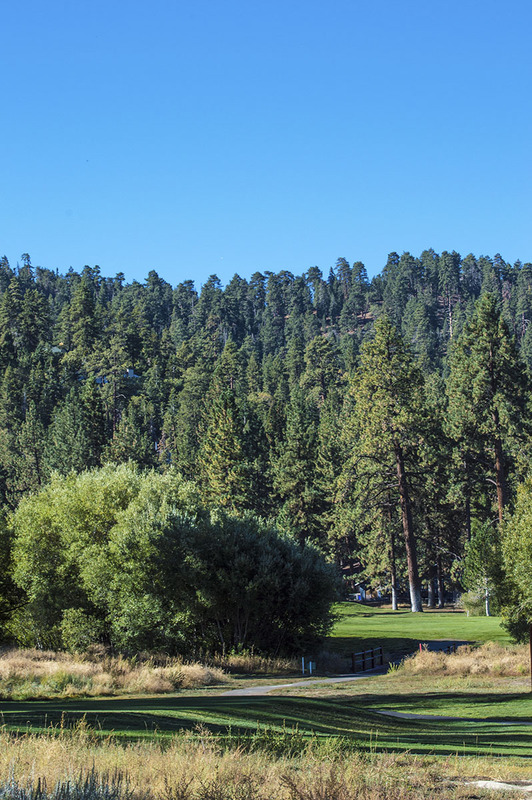 The placement of this particular observatory on the north shore of the lake stems from the fact that Big Bear experiences more than 300 days a year of sunshine and of course the clear skies at night. It is not always open for visitors, so check its website for open hours. Right next to the observatory sits one of two floating bathrooms on the lake. As we were learning how to operate the boat, the instructor asked if there were any other questions and of course as age fifty and above woman, we had to know the answer to the most important question of all… “Where are bathrooms located along the lake?” We were surprised to hear about these unique floating structures which they appropriately dubbed the S.S. Relief. We were even more surprised on how clean they were when we made our first pit stop. The large dock housed two bathrooms which were a far cry from the yucky outhouses I was expecting. 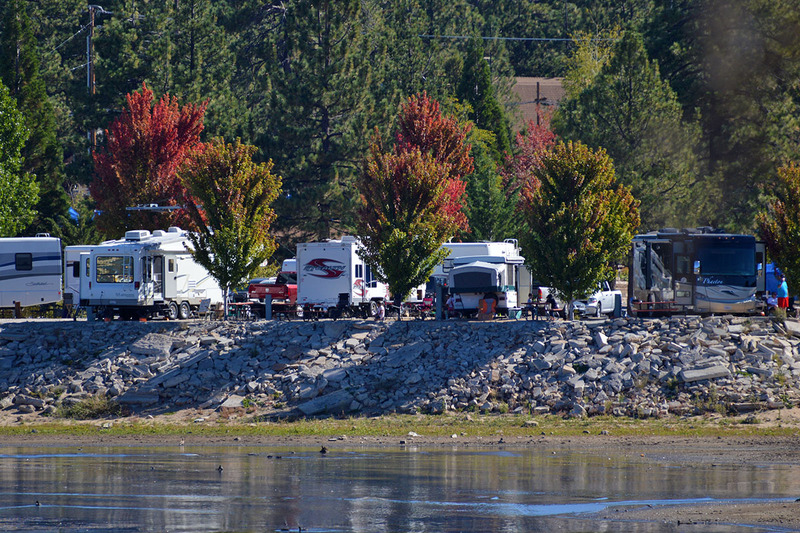 Score points for Big Bear Lake on this grand idea!! The lake was filled with participants of a fishing derby taking place that day so we were careful not to disturb the lines of the competing anglers. We had two poles thrown out ourselves but didn’t have much luck. 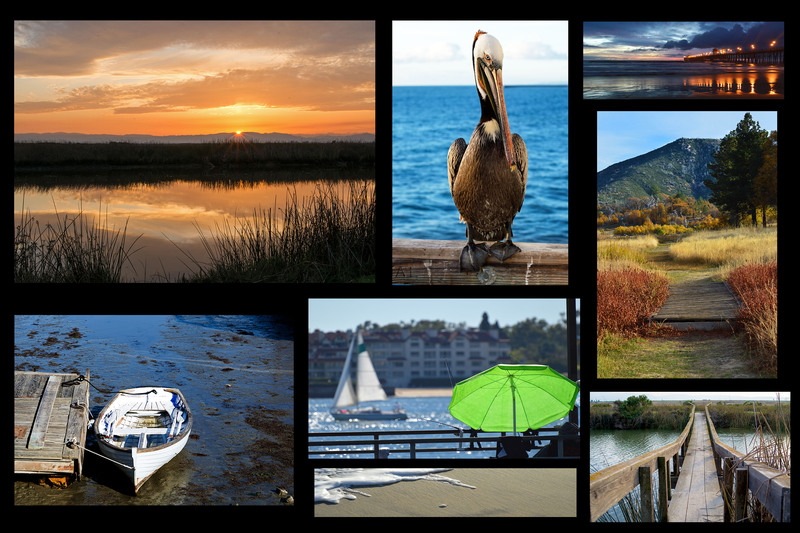 They say the lake is one of the top rated fishing locations in Southern California. 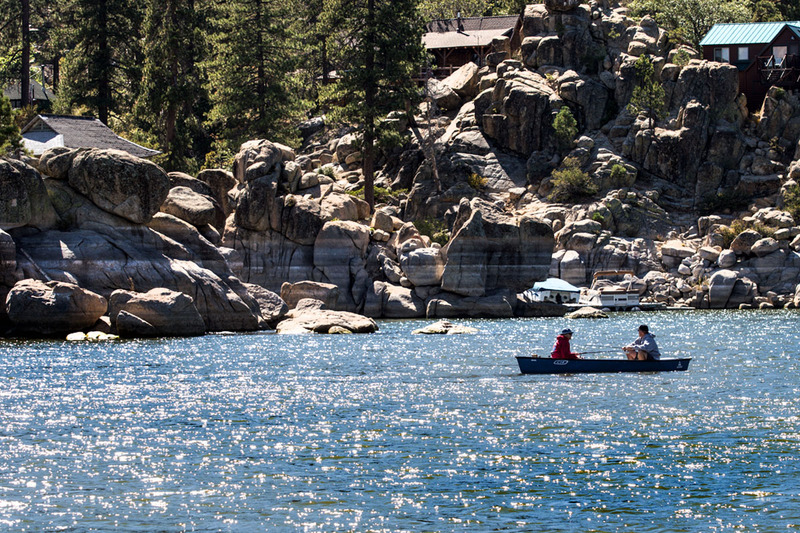 Trout, bass, catfish, crappie, blue gill, and sunfish are abundant in the lake although we didn’t find them or… they didn’t find us. Trolling along the lake you could see the now empty ski resort areas of Bear Mountain and Snow Summit. Soon they will come alive with skiers and snowboarders anxious to hit the slopes with first snow fall. 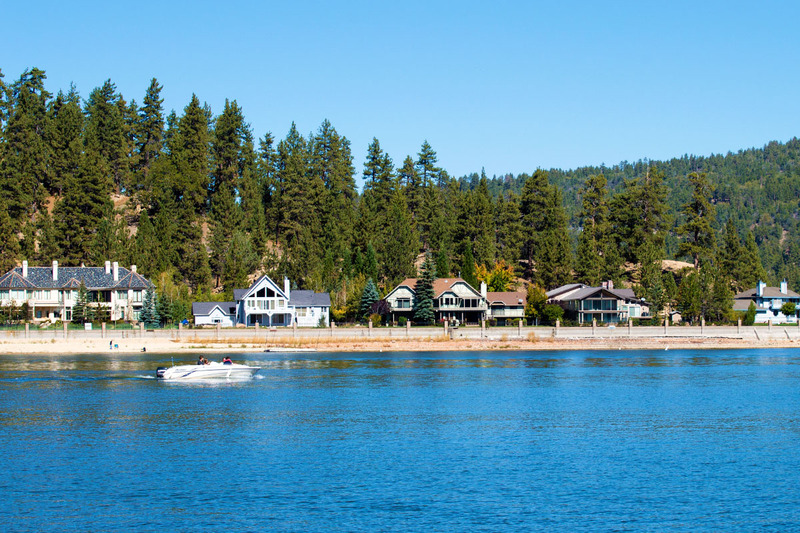 There are about 6,000-7,000 permanent residents in Big Bear, however, during peak weekends there could be as much as 100,000 visitors. Just a couple of miles apart from each other, the two resorts have plenty of runs for beginners as well as experts. They were one of the first ski resorts to accept snowboarding and Bear Mountain especially caters to this crowd with its half pipes and terrain park. To help insure top quality conditions, the resorts have advanced snowmaking technology to help Mother Nature if she doesn’t cooperate. Lodging and shops, and restaurants are all nearby also. As the wakes from other boats made us bobble up and down on the water, I starting singing the song “Yo ho, Yo ho, a pirates life for me” and much to my surprise and a few seconds later, an actual pirate ship floated by. 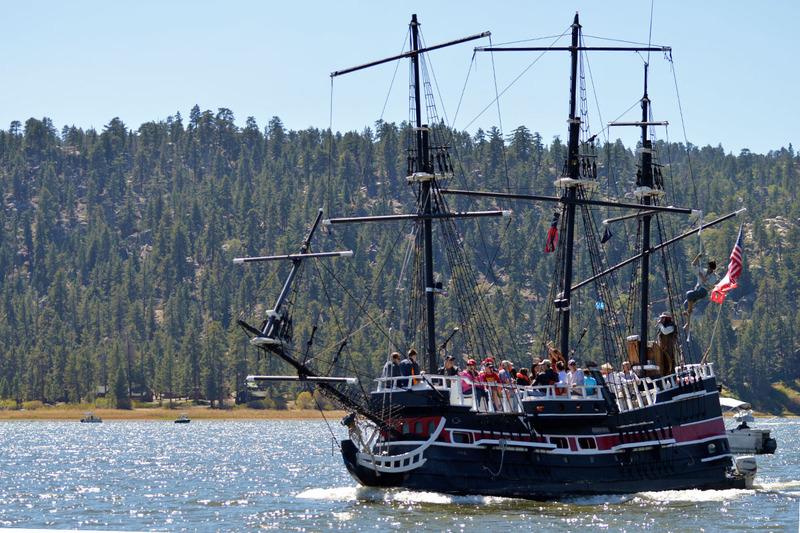 Kind of weird, but the “Time Bandit” pirate ship calls Big Bear Lake home and is an actual replica of a Spanish Galleon. As it passed by, the announcer was narrating interesting facts about the lake that you don’t get by renting a boat yourself. 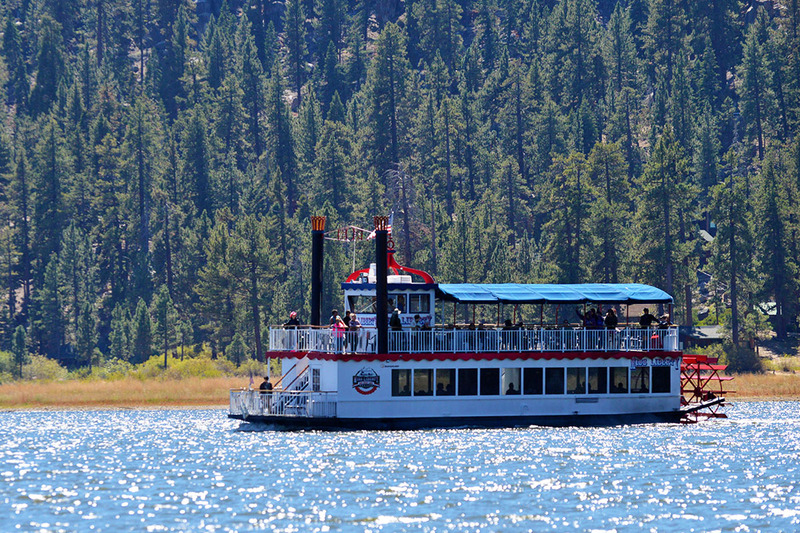 Soon after, the “Liberty” Paddle wheel boat cruised by with its share of enthusiastic passengers. Both boats offer daily cruises around the lake and as aforementioned there are 6 marinas that you should be able to find a tour that appeals to you. We passed by Boulder Bay which was not accessible because the drought in California has made the lake drop at least 13 feet. As we drifted by the giant rocks you can actually see where the water level was at one time. 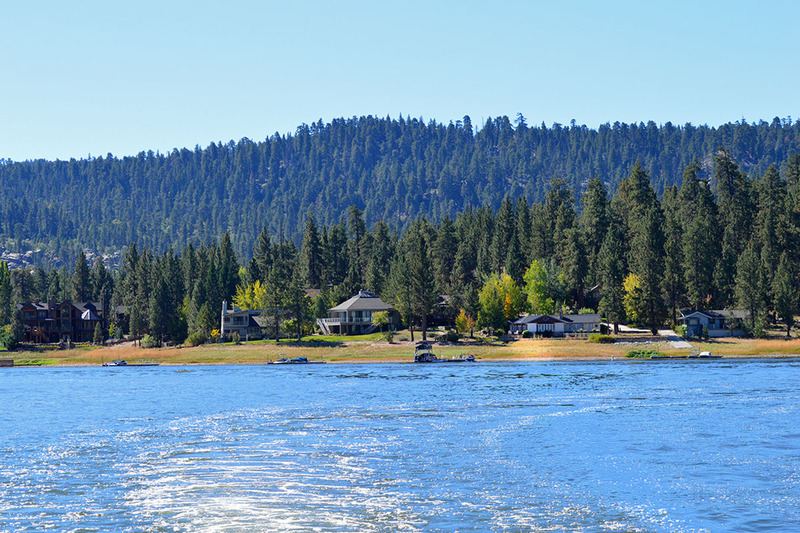 Nearby China Island is the only island on Big Bear Lake. 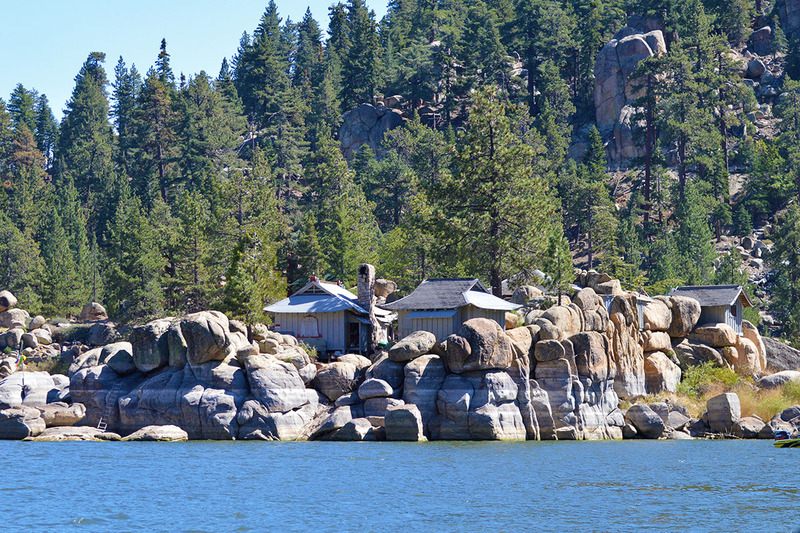 It has several China Huts built into the granite boulders that I was told were built back when they were building the dam over 100 years ago. 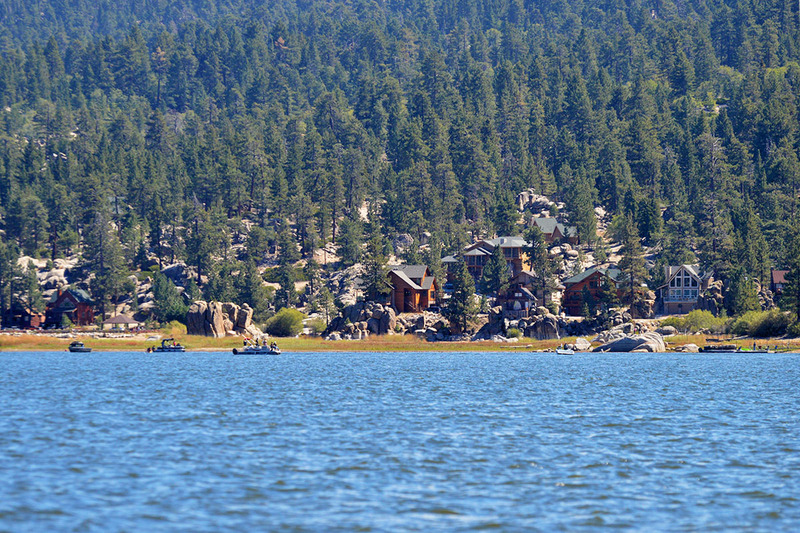 As we started heading back after almost four hours on the lake we were amazed by the expansive and beautiful cabins along the shore. 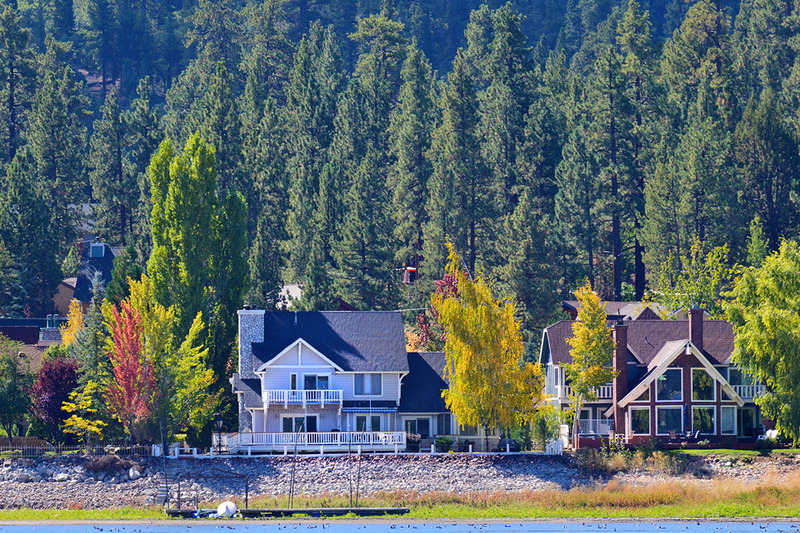 Even though it was just a few days into autumn, there were early signs of the trees changing color, particularly around some of the homes. 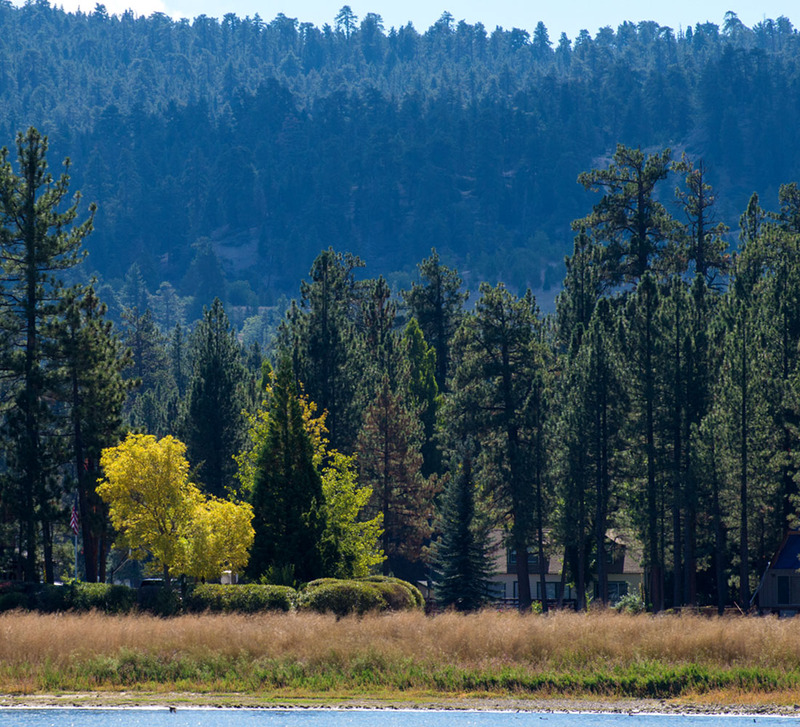 I have read that Big Bear is one of the premier places to view fall colors in California especially later in October and early November. Just a few miles from our cabin we visited the section of town called Big Bear Village. This charming shopping and entertainment area spans quite a few streets and features souvenir shops, restaurants, home décor, boutiques, etc. Along the way there are plenty of seating areas to rest your feet and outdoor fireplaces were scattered about for sitting back and enjoying the night. In the village there are always events happening throughout each month such as Chili Cook offs, wine walks, car clubs, music festivals, art shows, and so much more. Just past the village and on the main road, we choose the Hacienda Grill for dinner. This turned out to be a good choice as the restaurant served up some great Mexican food and provided a cozy atmosphere in their heated patio. Back to the cabin to nurse my sunburned face that I didn’t expect to get even though I was warned to use sun screen, after all we WERE closer to the sun. One tip someone gave me that I will pass forward to you: bring plenty of lip balm as the dry air can do a number on your lips. 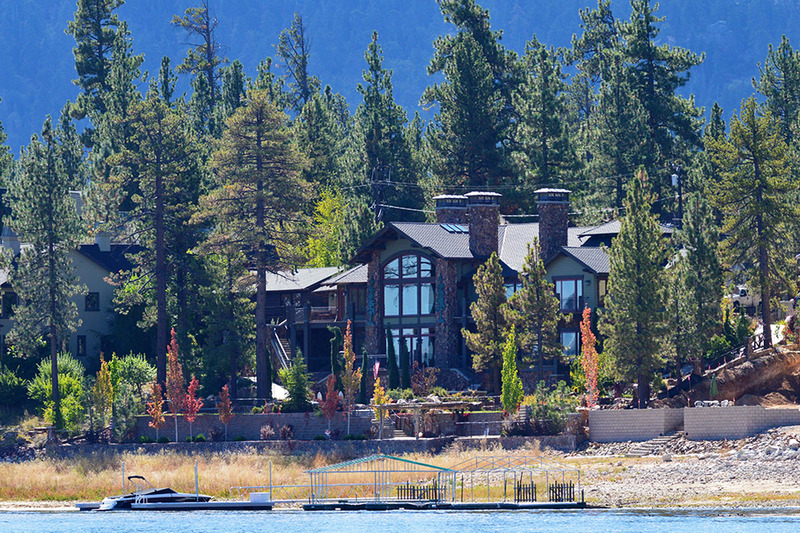 The cabin had a patio that over looked the many different species of pines that are native to the Big Bear Area and while sitting there, I wondered how Big Bear got its name. 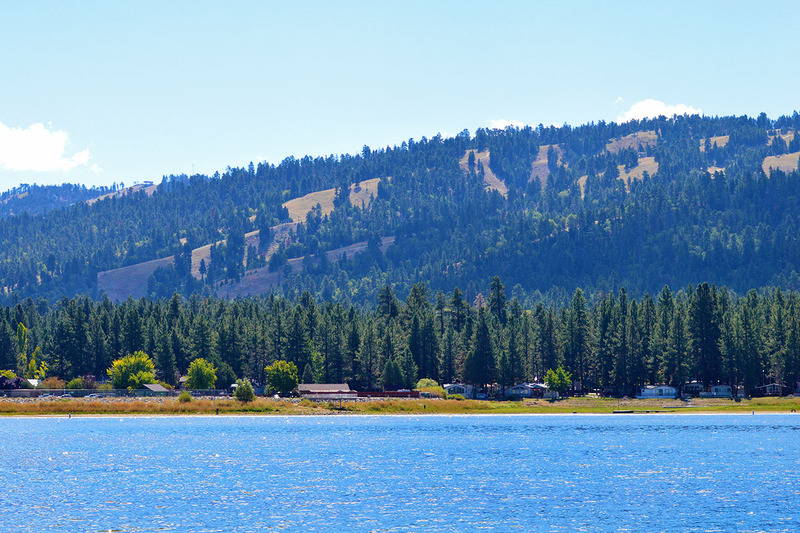 After reading the long history of the area, let’s just say Big Bear has a past filled with hunting, the gold rush, and a onetime huge population of grizzlies. The grizzlies no longer populate the area and are now replaced by the black bear. However, black bears are rarely seen in the populated areas as they hate crowds just as much as we don’t want to run into one of them. The end of the weekend came too quickly as it was time to make the trek back down the mountain. This time the weather turned a little colder and the rain pelted the ground pretty steadily. We were glad that the day prior blessed us with sunny weather for our excursion on the lake. I was not looking forward to driving mountain roads with fresh rain churning up the slick oil on the pavement but we made it down fine with only a few white knuckle turns that had visibility about as low as you can get. Back to ground level, sadly the pine trees disappeared from sight. 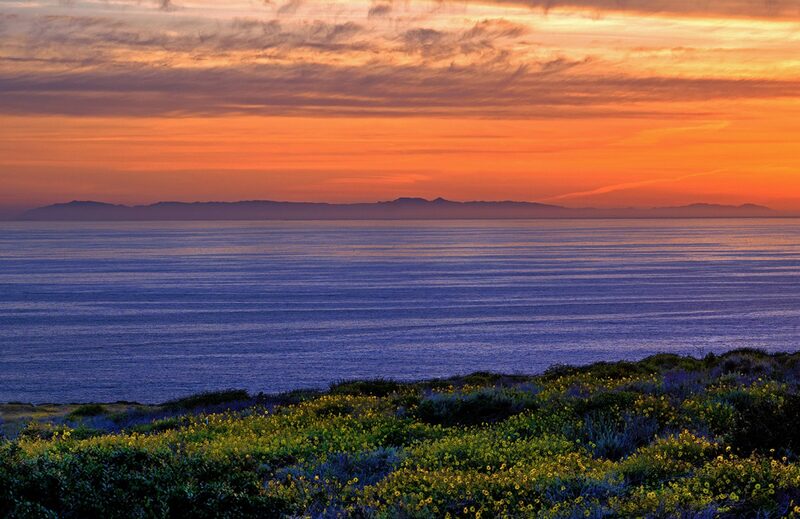 We all agreed that although we love our beach, the mountains are a great place to visit and to enjoy a change of scenery. 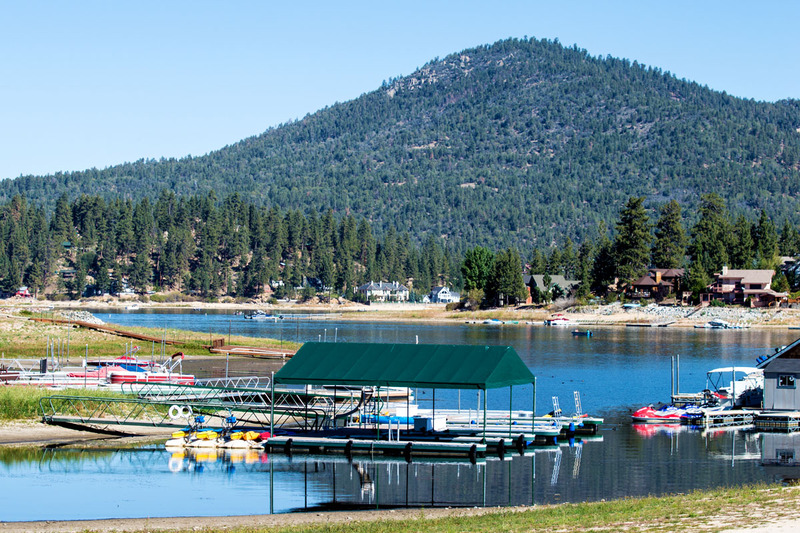 Big Bear is unique in that it has the lake for water activities and the slopes for winter activities. It is a place that can be enjoyed by every age group all year round. You will also love the quaint village and the small town feel of the area. 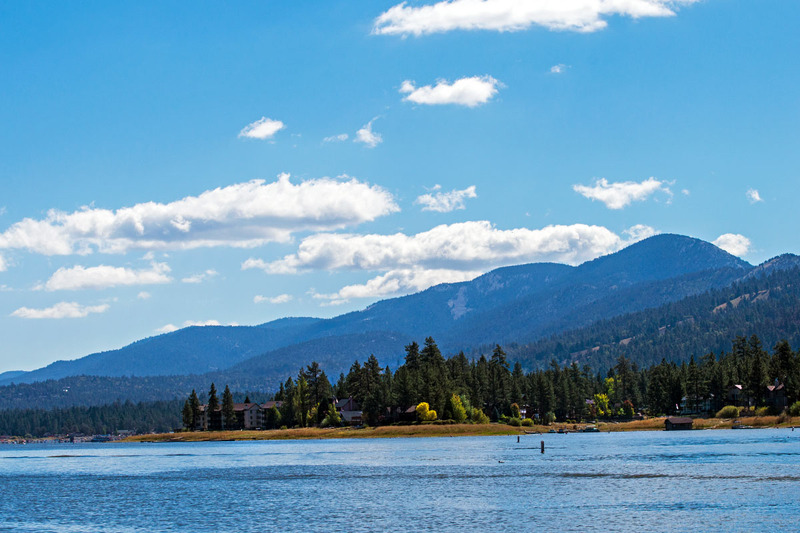 There is so much to do in Big Bear; we didn’t touch half of it. Next time we will try their new zip line or take the chair lift up to the top of Snow Summit to admire the spectacular view. The chair lift is open during all seasons and the View Haus restaurant sits on top for your dining pleasure. We were happy with our day on the lake and I am happy to say that nobody fell overboard although the sticky throttle on the boat almost claimed a victim or two. The lake was beautiful and we loved, loved, loved, what I feel is a great invention, the S.S. Relief. After all it is the simple things in life that make us happy: good friends, a comfy bed, great food, and a clean place to tinkle. It doesn’t get much better than that. 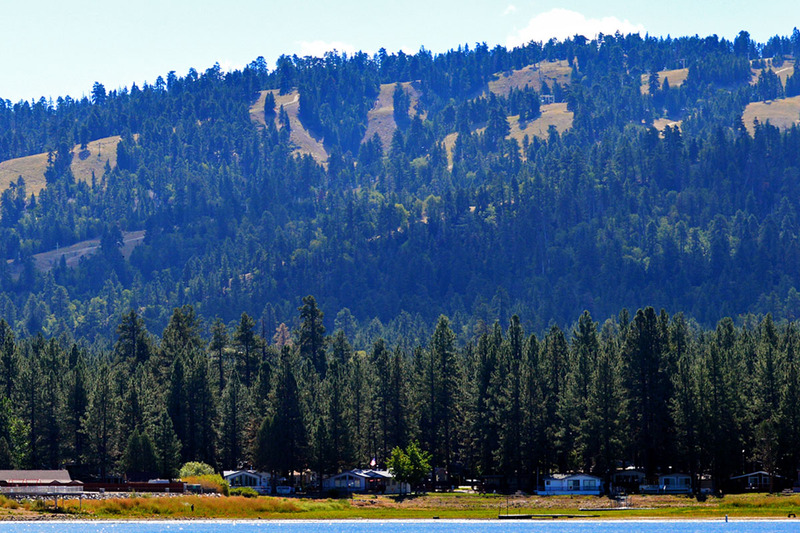 Big Bear Lake, is highly recommended by staycationscalifornia.com for a weekend or a week. Take plenty of water, lip balm, and more importantly, leave your worries behind. 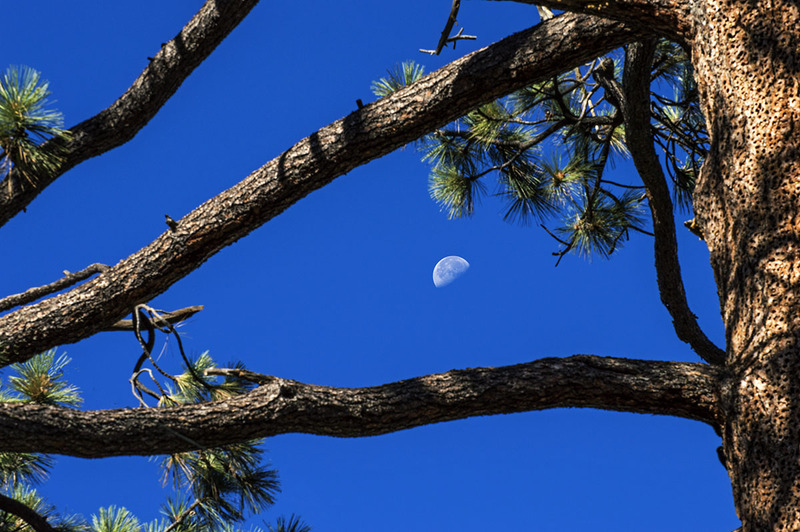 The moon was shining bright even at 2:00 in the afternoon.